The What: Bannister Lake is fully embracing the NDI workflow with its Chameleon data aggregation solution. Chameleon reads multiple data sources, including news, weather, sports, traffic, social media, and financial data content, allowing users to edit, moderate, and customize their data. The What Else: Using Chameleon's Query functionality, data can be parsed at a granular level, enabling producers to select subsets of data to target viewers. The solution automates the flow of data to endpoints, ensuring that content is consistently relevant and timely. In turn, using Chameleon's RESTful API, data content can be reformatted for distribution to virtually any device or endpoint. Chameleon also extends NDI well beyond broadcast as a data aggregation solution for eSports and digital signage, providing producers with new business opportunities. eSports events—broadcast, streamed, or in-venue—benefit from Chameleon's ability to read and display important game-related data feeds and provide fans with score boards, player profiles, standings, and other key data. Live data is an integral part of digital signage, keeping viewers updated with the latest news and information. In addition to managing traditional editorial data content, Chameleon provides a solution for producers who require a way to display local and hyperlocal content, including election results, school closings, and event calendars. In addition, Chameleon's custom data feature can ingest data from Google Sheets, providing an opportunity to integrate local sports data content. 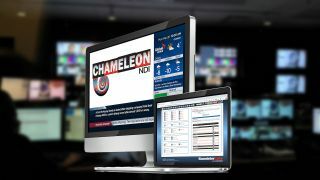 The Bottom Line: For producers working within the NDI ecosystem, Chameleon is designed as a straightforward method for bringing live data directly into their productions. To help the NDI community better understand the business, operational, and technical capabilities of Chameleon and data content in general, Alain Savoie, Bannister Lake's creative and technical director, will present his co-authored technical paper, "New Methodologies in Real-Time Data Aggregation and Management for Broadcast Presentation and Distribution," at the 2019 NAB Show. Along with Savoie, the paper was written by Hentsch and Bannister Lake's Vernon Freedlander, who heads strategic partnerships. The presentation will take place on Wednesday, April 10, at 4 p.m. at the Las Vegas Convention Center in Room N260. Bannister Lake will also exhibit at the 2019 NAB Show, in booth SL5616.